The immune system is formed by a complex network of cells, organs, and processes interacting together to constitute the main defense line of the human body against foreign organisms and diseases. One of its main components are lymphocytes, a subtype of white blood cells which include two types of cells, T cells and B cells. T cells and B cells are both generated from the lymphoid common progenitor in the bone marrow. T cells, also called thymocytes, are lymphocytes generated from a stem cell precursor, the lymphoid common progenitor, in the bone marrow. They migrate afterward to the thymus, a lymphoid organ situated in the chest, where they undergo their maturation. Mature T cells circulate continually in an inactive state between the blood and the peripheral lymphoid organs (the lymph nodes, the spleen, and the mucosal lymphoid tissues) until they encounter foreign antigens from the sites of infection. In this case, they are activated and differentiate into effector cells. Two classes of effector T cells with distinct functions exist – cytotoxic T cells and helper T cells. Cytotoxic T cells are capable of attacking and killing other cells infected with an intracellular pathogen or a virus. Helper T cells, on the other hand, present an indirect immune response by stimulating other defense mechanisms and cells such as macrophages, B cells, and cytotoxic T cells. They are effective against intracellular and extracellular pathogens as well. Cytotoxic T cells and helper T cells alike, are characterized by the presence of membrane-bound antigen receptors and are activated through a direct contact with an antigen-presenting cell. Cytotoxic T cells act by inducing their target pathogen-infected cell to undergo apoptosis through the activation of the caspase cascade. Helper T cells, when activated by an antigen-presenting cell, act by secreting different cytokines and by expressing specific stimulatory proteins on their surface. They can differentiate into two types of helper cells – TH1 and TH2 cells. TH1 cells function by activating macrophages and cytotoxic T cells, while TH2 cells function by activating B cells. B cells are lymphocytes generated from the lymphoid common progenitor in the bone marrow. They undergo their maturation in the bone marrow as well, at the same site of their formation, hence their name B cells. Upon maturation, B cells enter the bloodstream before migrating to the peripheral lymphoid organs. 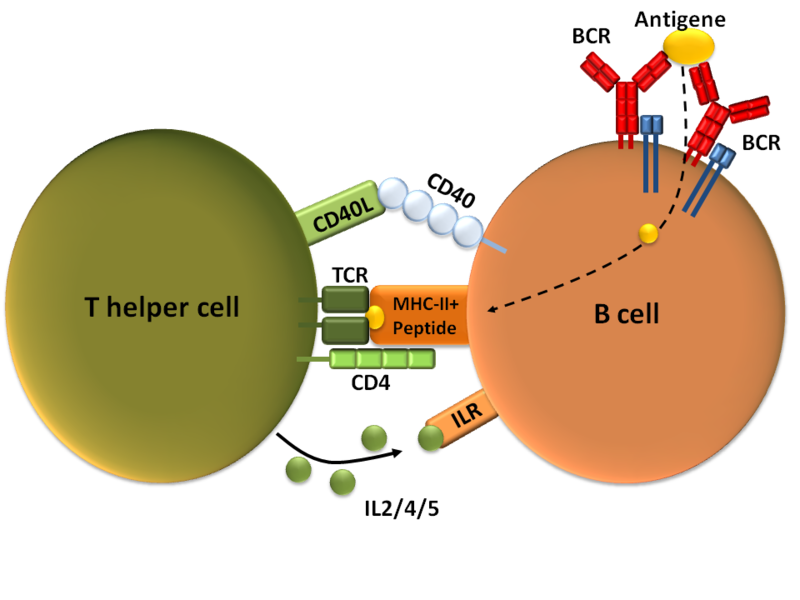 B cells are characterized by the presence of antigen receptors on their membrane. When activated, they differentiate into plasma cells and secrete antibodies or immunoglobulins, which are mainly the secreted form of their membrane antigen receptors. While some antigens can trigger a direct response from the B cells, their main mechanism of action depends on their interaction with the helper T cells. Activated helper T cells are responsible for triggering the proliferation of B cells and the secretion of the specific antibodies. The secreted antibodies can therefore recognize pathogenic antigens and bind specifically to them. The pathogen is either directly neutralized by the antibody, or tagged to be destroyed subsequently by other components of the immune system such as macrophages. Difference between T cells and B cells? T cells and B cells are both generated in the bone marrow from stem cells or more precisely form the lymphoid common progenitor. T cells or thymocytes maturate in the thymus, a lymphoid organ situated in the chest, while B cells mature in the bone marrow, at the same site of their generation. Both T cells and B cells migrate to the bloodstream after their maturation and circulate between the peripheral lymphoid organs in an inactive state. There are two types of activated T cells: Cytotoxic T cells responsible of the destruction of cells infected by intracellular pathogens, and helper T cells responsible of activating cytotoxic T cells, macrophages, and B cells. 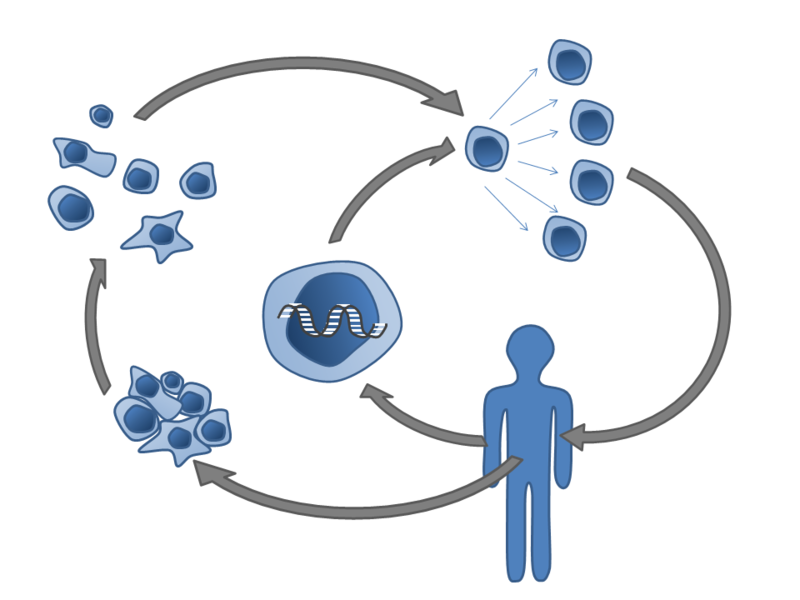 B cells, on the other side, differentiate upon activation by helper T cells into one cell type, plasma cells capable of secreting antigen-specific antibodies. Activated T cells present antigen receptors on their membrane and are not capable of secreting antibodies, whereas activated B cells are responsible for antibody secretion. T cells undergo maturation in the thymus, while B cells undergo their maturation in the bone marrow. T cells present antigen receptors in their membrane and are not capable of secreting antibodies. They can act as cytotoxic T cells by directly attacking cells infected with intracellular pathogens, or as helper T cells by indirectly activating other immune cells including cytotoxic T cells, macrophages, and B cells. B cells present antigen receptors on their membranes but are also responsible for secreting antibodies when activated by helper T cells. The secreted antibodies are highly specific and attach to the antigens provoking the destruction of the infecting pathogen either directly, or indirectly through the subsequent recruitment of other immune cells such as macrophages. Lyne Chahine-Böhme. 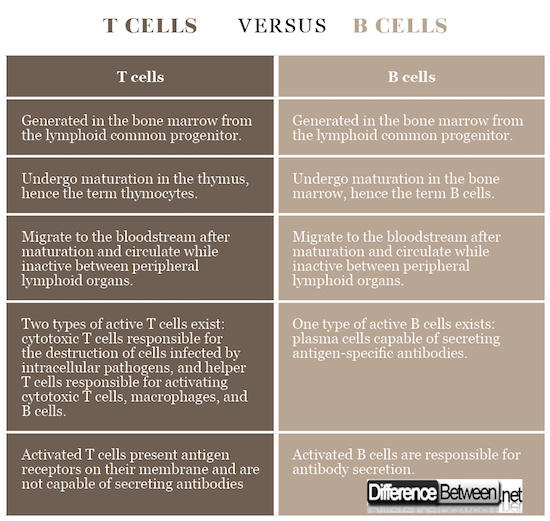 "Difference Between T cells and B cells." DifferenceBetween.net. April 12, 2018 < http://www.differencebetween.net/science/difference-between-t-cells-and-b-cells/ >.